Popcorn ceiling, stucco ceiling or acoustic ceiling are the same names of the bumpy textured ceiling that was common in the last century. If you want to remove the stucco ceiling, it is best to get help from a professional painter. Learn why removal of popcorn ceiling on your own can be hazardous to your health. In 1950s, stucco ceiling or ‘popcorn ceiling’ was in fashion. It allowed homeowners to conceal ceiling flaws and even improve acoustics in a room. Because of its low maintenance and fire-resistant features, it was widely accepted in homes. However, the late 1980s and 1990s saw a steady decline in the use of stucco ceiling when it came to light that few stucco mixtures contained asbestos. Today, popcorn ceilings give your home an outdated look and they attract dust particles which can have an impact on your family’s health. If your home has a broken stucco wall or ceiling that is crumbling down, it is best to remove it. Removing stucco ceiling is a messy, tedious and time-consuming affair. It begins with removing all the furniture and lighting fixtures from the room. Once you have preped the room, you need to spray the ceiling with water and allow the popcorn ceiling texture to absorb it. Once the texture becomes moist, you will have to scrape the ceiling slowly with a scraper. The task may seem a simple one that can be finished over the weekend but wet ceiling can be too messy to handle. Why you need an Experienced Painter to remove Stucco Ceiling? In the old days, popcorn ceiling or acoustic ceiling contained traces of asbestos. When the government realized that it can cause lung cancer and several other diseases, it was banned. If your house was built before 1980s, there’s a big chance that the crumbling ceiling contains asbestos. You need to test the ceiling for asbestos residue and hire an expert painter for handling the popcorn ceiling. Removing the popcorn ceiling doesn’t end the story. Once the entire texture is scraped off, all the cracks, holes, seams, patches and other flaws will be visible. It means you cannot leave the ceiling as it is. You need to clean the ceiling and refinish it to restore the beauty of the room. It requires the skill and expertise of a painter to repair the drywall and paint it beautifully so that it matches the rest of the walls. You cannot drop the debris in the dumpster and get away with it. If the popcorn ceiling had traces of asbestos, you need to dispose it according to the local government rules. So, you need an experienced contractor who knows how to dispose the waste at the intended waste disposal site after packing it specifically. It should not mix with other waste and the contractor should take all the necessary precautions to prevent the asbestos fibers from being airborne. Remove Popcorn Ceiling from your Home Today! Popcorn belongs in a movie theatre bucket drenched in butter, not on a ceiling. Popcorn ceiling is an old concept. If you are looking for your home to have a modern appeal, it is best to remove it. The texture of the ceiling can attract dust and can cause allergy issues to your family members. And, if you are worried about asbestos in the ceiling, it is best to get it checked and remove it with the help of an expert. Find a reliable home painter in your area or a reputed general contractor who possesses the expertise of taking care of stucco ceiling and get ready for a healthy, modern home. 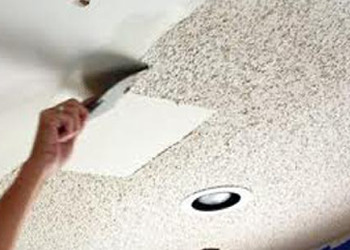 Do you want to remove popcorn ceiling? Allow Perfect Painter, the professional stucco removal specialist to give you a new ceiling that will make you proud. Choose the talented Toronto home painter for quality home painting services. I just had mine done by Perfect Painters, and they look amazing! I’d never do it myself, much better left to the professionals, Perfect Painters!